Home > Old World Christmas - Traditional Glass Christmas Ornaments > Old World Glass Ornaments - "Wedding Collection" - FREE Shipping Item! Use code BRIDEFREESHIP at checkout! 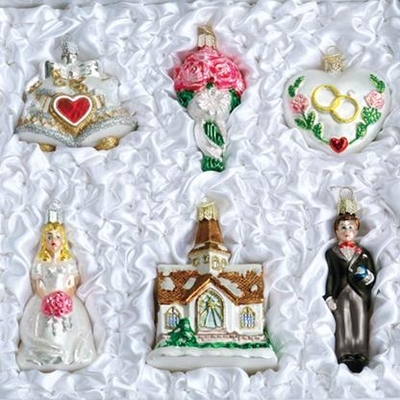 Old World Bride's Tree or Wedding Collection - FREE GROUND SHIPPING* within the Continental US. Enter coupon code "bridefreeship" during checkout! Each glass ornament produced for the Merck Family's Old World Christmas Glass Ornament line is hand crafted in age-old traditions. Each ornament has an embossed heart-shaped charm to reflect the love and joy of the holidays. The heart charms also serve as easy identification of exclusive Merck Family's Old World Glass ornaments for Christmas and All Occasions. Beautiful set of six wedding related ornaments in a white satin boxed with satin lining...ideal for a gift and for storage year to year. This is sure to be a cherished keepsake. Certificate that can be personalized is included. 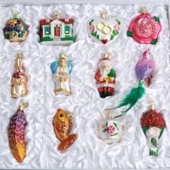 Ornaments range is size from 3" to 5"